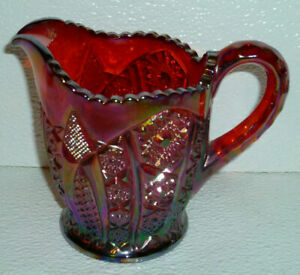 Details about Indiana Creamer Sunset Red Carnival Glass Paneled Daisy Vtg Iridescent 4.75"
Indiana Creamer Sunset Red Carnival Glass Paneled Daisy Vtg Iridescent 4.75"
Vintage carnival glass bowl rose pattern, iridescent, orange color. 1950s IMPERIAL Carnival Glass Frosted Iridescent Compote Bowl. Carnival Glass Sea Shell Dish 8"